I didn't post anything last week because we were away - a full week at some nearby beaches with family and friends. Not being a beach person to begin with, I can now say that seven days with five sand-filled kids is a bit much! But we did have lots of fun. My kids still have one more week off before school starts, and not much to do. Letting them play with SketchUp is always a good way to keep them occupied for a while, and here are some examples of what they did today. 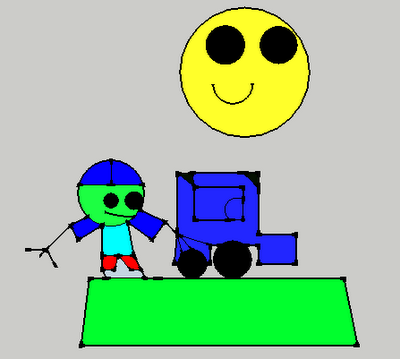 And my seven-year old son's "boy car sun" depiction. 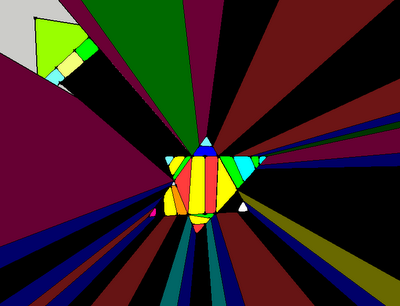 My seven year old is autistic (PDD), and usually uses SketchUp for 3D models like houses and robots. Today he was in a 2D mood, apparently. He generally likes to create the same models repeatedly, but this was the first time he made the above picture, and got very excited. These are great! I love the use of colors in the top one and the sun's big eyes and the boy's hands. So cool. It's nice to see an uninhibited use of this software. Projects of the Month - Signup is Ready! Want to Know What I Really Think?